MindShifts Mentoring Services are intensive team and one-on-one sessions that have been designed to help the client attain a high degree of specialist knowledge within a short time frame. These sessions can be geared towards establishing your own CI practices, developing specific skill sets or receiving support and guidance for specified Competitive Intelligence projects. 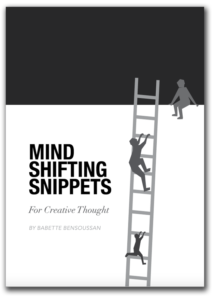 All MindShifts mentoring sessions are conducted by Babette Bensoussan; an internationally esteemed Competitive Intelligence professional with extensive experience in coaching and mentoring. Mentoring programs are all tailored to suit needs and desired outcomes. We offer a comprehensive suite of services designed to give you a superior understanding of the many competitive forces that impact your organisation. MindShifts will always look at everything that affects your business with a fresh and insightful set of eyes. With over twenty years experience and 350 successful projects, MindShifts is the only Australian consulting firm specialising in Strategic and Competitive Intelligence. Facilitating product and brand managers to plan appropriately for the future. To learn more about our services and expertise, contact MindShifts today. Mentoring sessions can be conducted face-to-face in Sydney or via telephone or Skype whenever necessary. Unlimited telephone and email support is available throughout the duration of any mentoring program.